When you dig through skating history, you never know what you will unearth. In the spirit of cataloguing fascinating tales from skating history, #Unearthed is a once a month 'special occasion' on Skate Guard where fascinating writings by others that are of interest to skating history buffs are excavated, dusted off and shared for your reading pleasure. 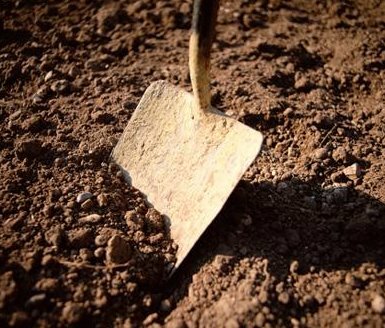 From forgotten fiction to long lost interviews to tales that have never been shared publicly, each #Unearthed is a fascinating journey through time. Today's gem, entitled "An Evening On Dutch Skates", originally appeared in "The Badminton Magazine Of Sports And Pastimes" in 1898. It was written by Ethel Brilliana Tweedie, a prolific British travel writer and historian. In the cities of Holland more people probably skate at night than during the day. This, of course, does not apply to country districts where frozen canals form the chief highways through the skating months, and where the people naturally convey their goods to the nearest market while daylight lasts. In the towns this is different; night skating is for pleasure and not for business. Thousands of young folk who are employed all day in shops, warehouses, post-offices, etc. : free in the evening to enjoy themselves to the best of their ability; to take as much exercise as they can, accompanied by amusement; and therefore it is that after eight o'clock the frozen waterways are a teeming mass of human life. They become, in fact, one huge fair. Chattering men and joyous maidens, elderly fathers and fat, round mothers, small children who for the nonce are allowed to stay out of bed, all wend their way, skates in hand, to the canals and enjoy an hour or two of healthful exercise in the dim light of evening before returning home for the night. The scenes are gay and animated, and most marvellously picturesque. Here and there a booth has been erected whereat tea or steaming potatoes and sausages are sold, or a 'kop' of coffee, thoroughly stewed, as all Dutch coffee is, temptingly invites the passer-by to partake of light refreshment. This booth is lighted by various blazing beacons placed in those iron stands which we in this country politely designate 'devils.' The booth itself is often a very primitive structure, made with four poles thrust into the ice, covered with brown canvas, and adorned perhaps by a little paling, so that it looks more like a gipsy's tent than an ordinary booth at a fair. The table inside is very unpretentious; but the planks on trestles serve the purpose of holding the boiling urns and the cups and saucers. A few chairs placed round the fire give a cosy look to the interior ; and as the skater flits past, the effect of light and warmth, merriment and joy, emitted from the tiny shed is very pleasant - the lurid glare from the blazing fire casting a rosy hue on the occupants whose forms throw quaint shadows on the canvas walls. Here and there at intervals along the ice other fires are kindled, not so much for warmth, perhaps, as to shed a shimmering glow of light upon the frozen surface; for so many skaters flying hither and thither in darkness, at the terrific speed they practise in Holland, would be very dangerous but for these flaring beacons. The charm of Rotterdam is not its museums or its pictures, but its waterways, its queer corners and endless bridges. Leaving the hotel on the quay, designated by the awful name of Do Boompjes, which literally means trees - for there are some small specimens planted along its edge in the form of an avenue - we sally forth to skate. It is a strange thing to find the best hotel of the town standing on a quay, literally in the midst of the docks, before which steamers of all kinds are held fast in the ice, while on the embankment are piled up cases of goods, with here and there enormous cranes such as denote shipping life. Yet this is the most fashionable part of Rotterdam. There are some fine private houses on De Boompjes besides hotels, and it is altogether the aristocratic as well as business quarter of a town where it is the custom for families to live over the office. Market, the enormous cheese market with its terrible and awful smells, and the hall where fish is sold, are worth a visit; they are intensely Dutch, these fat women in short skirts made so full at the waist that the wearers appear broader than need be, while the pretty muslin caps studded with golden pins seem the very essence of a living Dutch doll. All these kindly, round-faced folk are, alas no better looking than they were in the days of Gerard Dow, Van Ostade, Teniers, etc. Strangely enough, in all the pictures of that time the Dutch women, even when out of doors, generally appeared gowned in low dresses! The fish at the market are complacently swimming about alive in huge tanks placed in rows, our idea of dead fish shops being considered by the thrifty Dutchman simply ridiculous. We had arranged to skate from Rotterdam to Gouda; but before doing so we decided to have a trial trip with Dutch skates on the canals of the town. It is a delightful journey from Rotter-dam to Gouda, and from Gouda to Amsterdam. Leaving Rotterdam one skates over the ice through the Hague, Leiden, Haarlem, to Amsterdam; or from Leiden to Utrecht by the Rhine. Man proposes, God disposes/ however ; and although we arranged our plans and made everything ready to skate to Amsterdam the thaw came, and that particular expedition was frustrated. For any length of journey, it is absolutely necessary to use Dutch skates. These are from sixteen to twenty inches long, and the turn-up of the toe allows the blade to skid over the ice, instead of hitting it. These Dutch skates are made of wood and are very shallow, the feet being raised little more than an inch from the ice. The funny part of them is they are not secured to the boot at all, but are merely attached by cord, which stretches from the heelstrap across the foot, and is tied in a big bow over the toe. The cords are generally bright yellow, and give a fantastic appearance to the foot-gear. The reason for wearing things so easily adjusted is to be found in the fact that when skating great distances one often has to cross a tract of land or walk along a bit of road, when it becomes necessary to stoop down, untie the bow, and, skates in hand, trudge along to the next piece of ice. Therefore in the country one often sees the market folk bend down, untie their cord, kick off their skates, and march along for five or ten minutes till they reach the canal they want, when they slip their feet back into position and in a moment are skating away again. When it is a matter of merely crossing a road or walking a short distance, they do not take off their skates at all. ice is almost impossible, and the large tracts of frozen waterways become very rough by reason of the wind, which blows the newly formed ice into little ridges, and the snow which collects upon its surface into small hummocks. It is because of this roughness on the surface of the ice that these long bladed skates are necessary, for they will carry the wearer over anything, cracks included. 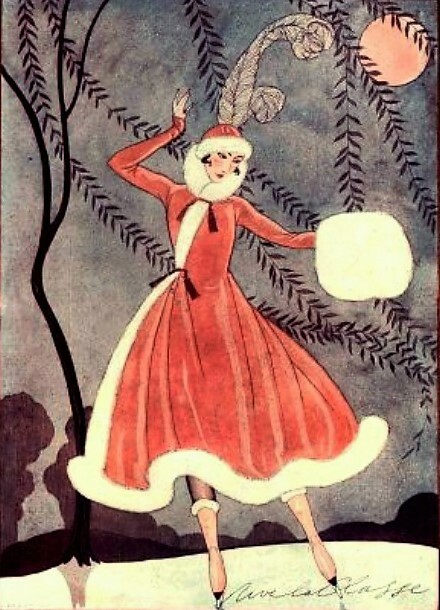 frosty night air, the old women with baskets of bright-skinned oranges, and those delicious shades of red and brown that seem to pervade everything in Holland. everyone tries to tear along as quickly as he or she possibly can, their arms going like windmills. It is not a graceful style of performance, but it serves the purpose, and the ice on which they skate practically prohibits outside edge and suchlike artistic performances. We were quite alarmed by some of the gymnastic feats of the youngsters, and, after a sudden and unexpected blow from a whirling arm, panting and gasping we hired a chair, and sat down free from the hustling of the seething crowd, in order quietly to regain our breath, and quietly contemplate the passers-by. That they enjoyed themselves there is no doubt, for never did youth seem more gay. arranged like onions on a stick, when away they wildly flew, their feet moving in unison as the great black mass tore from canal to canal, or rushed madly under and out of bridges. We learnt that this peculiar style of entertainment had arisen in consequence of the frequency of east winds in the Netherlands in winter. Had all those people been skating abreast each would have had to contend with the blast. As matters were, the first one only had to withstand the piercing wind, the others sheltering behind him and each other. As the lead is, therefore, more anxious and tiring, members composing the party change now and again, the one who was formerly in front being put for a change behind. first bursts of amusement on the part of the bystanders, they were very kind to the old soul - picked her up, put her on her feet again, and did what they could to restore the shattered fragments to her market basket. It was certainly a quaint evening's entertainment for us, as well as a cheap one. Beyond paying twopence to have our skates put on, it had cost us nothing. Occasionally we came across parents trundling in front of them box-like perambulators containing little rolled up bundles of humanity; or sometimes we saw a baby, enveloped in a woollen hood, sitting in a common wooden box, attached to a string, and dragged along by a young brother or sister. how to push their burden in front of them, and it is wonderful to see the little sledge, laden with milk cans, carcasses of meat, tubs of flour, or the hundred and one things used in commerce, propelled perfectly evenly over miles and miles of frozen waterways, dammed up by those wondrous dykes, many of which were made three hundred years ago. These dykes are peculiar to Holland, for they are merely sand piled up against a well-driven wooden paling over which a rough sort of grass is grown - a kind of bent, in fact, such as one finds by the sea shore in Scotland, which the Highlanders plait into mats and baskets. Edam are absolutely built on shifting sand, as is very evident from the leaning appearance of many of the houses. Indeed, whole streets possess rows of houses out of the perpendicular, and props from the ground to the house wall are quite common. To a stranger the sight is alarming, for the angle is sometimes as great as that of the famous tower at Pisa, which makes one giddy to look at; but the Dutch do not mind, and dwell in slanting homes as happily and contentedly as we do in our straight ones. Iceboat sailing and skating are the two amusements which rouse a Dutchman to the greatest enthusiasm, but while money is required for the first, one and all can enjoy the second - and they certainly manage to do so. There is no doubt about it that a very indifferent skater may have a good time in Holland when the canals are frozen; for once there comes a frost, the ice generally lasts for some weeks, and, provided the east wind is not too strong, Holland may then practically be traversed from end to end on skates. double and treble the distance on the long, low Dutch blades. Travelling in Holland is not expensive; in fact, in some of the out-of-the-way places, and especially in Friesland, it is cheap. But there is one drawback to seeing the country by this means: this is that not a single soul outside of the towns can understand anything but Dutch, and the natives do not show great adaptability at jumping at conclusions or comprehending the gesticulations of the unhappy traveller. With a good map much may be done, and, indeed, the entire route planned before leaving the chief hotels. Still it is worth mentioning the fact that some difficulty may be encountered in connection with the language; for several times, even in our small way, we came across instances of dense stupidity on the part of the natives. At least, we thought so - perhaps it was our own dullness and inability to make ourselves understood. One lad, more enterprising than the rest, replied to some inquiry, 'Oui, Madame,' whereupon we repeated the question in French, when he again answered ' Oui, Madame.' This was so satisfactory that we asked for further information. ' Oui, Madame,' replied the grinning lad. His manner was a little exasperating, but we still persevered. ' Oui, Madame,' he persisted. The little wretch had not understood another word. ' Oui, Madame ' was all he knew in any language but his own ! In little out-of-the-way hostelries in the smaller villages there is one great recommendation, and that is their wonderful cleanliness. The Dutch are a nation of washers! They are always scrubbing or cleaning something; and even in quite little inns clean rooms and spotless beds are always to be found, so that many might do worse than pack up their traps, and be off to Holland with the beginning of the frost; for they will probably have a good time, see much that is interesting, and thoroughly enjoy themselves at a small cost. Almost every house we passed as we drove borne had looking glasses at the sides of the windows to enable the inhabitant see who was passing along the street. Does this imply that Dutch are a very curious people, or that their lives are so as to make them herald any little excitement with joy ? The thaw began that night, and a couple of days later the ice was very much cracked and covered with water. Luckily we had no spills, which would have meant a veritable bath. not slow to take advantage of its advent, and make every possible use of it, both for business and pleasure, as long as it lasts. The Hub Trio. Photo courtesy Mary Anna Paquette. From 1916 to 1918, three young men were born in Manchester, New Hampshire who would go on to greatness. Leonard 'Len' and Kenneth Mullen were born in 1916 and 1918 - just two of the seven mouths that James and Sarah (Keough) Mullen had to worry about feeding on the modest wages of a loom fixer at a cotton mill. Edmond 'Eddie' Raiche, the youngest son of Amedee and Angeline Raiche, was born in 1917. 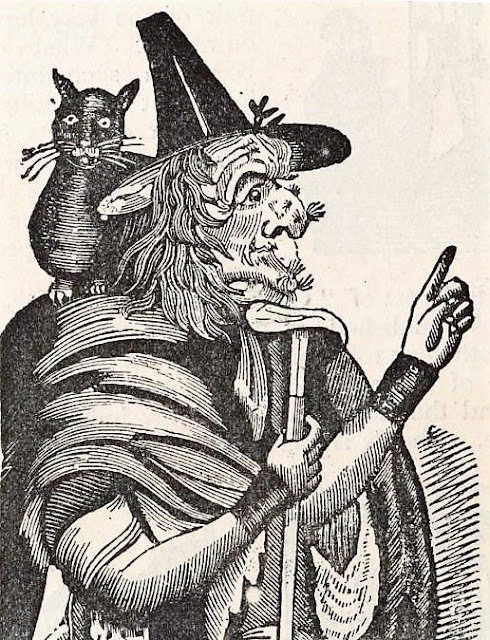 His background was equally modest - selling wood and coal was the family business. 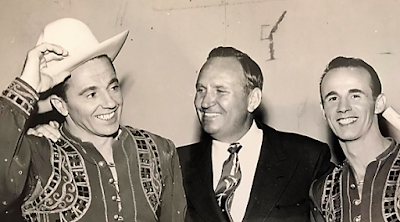 Len and Kenneth Mullen with Gene Autry. Photo courtesy Jared Hergenrader. It was Len and Kenneth Mullen's older brother Fred that taught them how to skate. 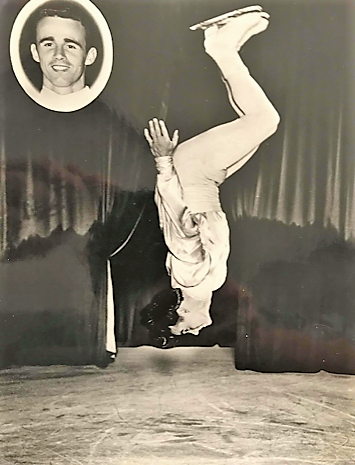 Fred was a wiz at acrobatics, tap dancing and ice skating and would take Len and Kenneth Mullen, along with their younger brother Russell, to Dorr's Pond. In between skates, the Mullen boys learned how to do backflips in the snow next to the pond. They also took lessons with George Nissen, the inventor of the trampoline, in an effort to perfect the stunt. In 1942, Eddie gave up his job at a paint store, Len stopped working as a surveyor and Kenneth quit being a photo engraver. They joined the cast of the brand new Ice Capades tour, going by the name The Hub Trio. 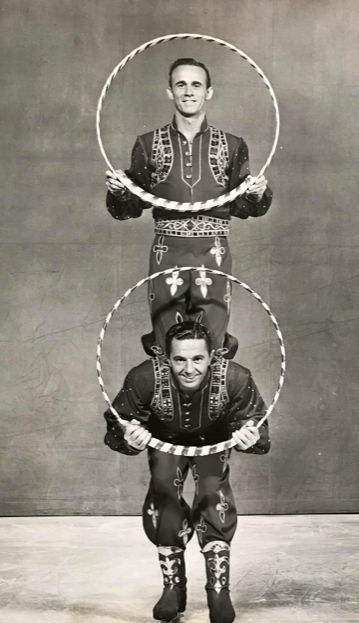 Len and Kenneth were billed as 'the Mullen twins', even though they weren't twins at all. 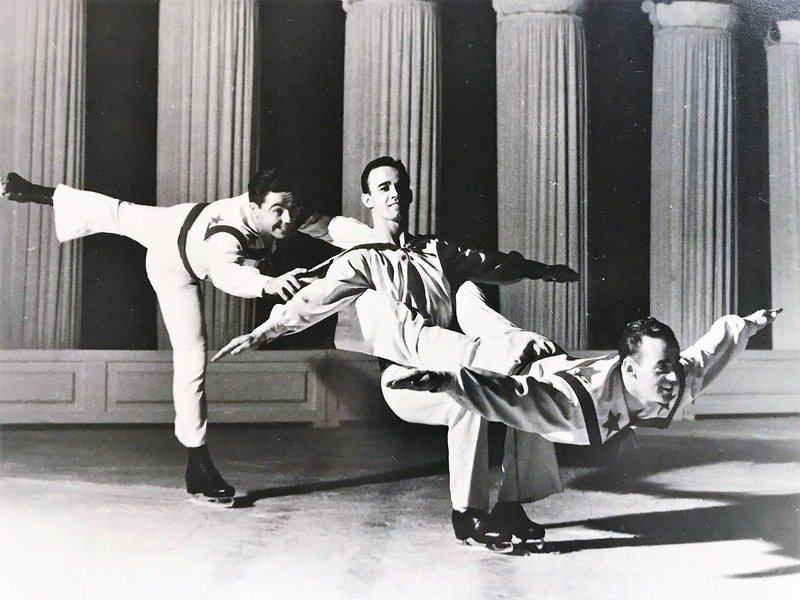 They were instant hits with audiences, including the backflip in their acrobatic act to "Anchors Aweigh" and "We Join The Navy", sporting sailor suits. As Adele Inge also performed the backflip on skates in 1942 or 1943, it is extremely difficult to say who was the first, but The Hub Trio were definitely one of the first acts to include the crowd-pleasing trick in their programs. Kenneth Mullen's grandson Jared Hergenrader asserted that her grandmother knew Skippy Baxter, and claimed that Kenneth performed the backflip before him. In 1944, Len and Kenneth Mullen joined the navy. 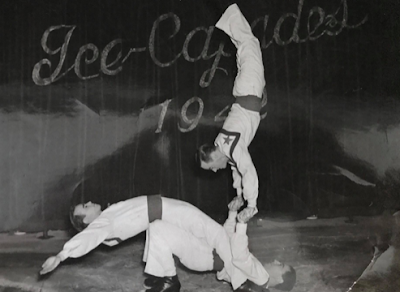 The Hub Trio returned to the Ice Capades and Ice Cycles after the War, appearing for a time as the Hub Duo minus Eddie. They appeared on The Art Linkletter Show and gave a performance before the Royal Court in England! Len and Kenneth Mullen (left) and Kenneth Mullen (right). Photos courtesy Jared Hergenrader. Two of the three members of the Hub Trio married skaters from the Ice Capades cast. Kenneth's wife Carmel and Eddie's wife Voline were both Ice Capets. Len's wife Eleanore was a singer who performed with the Malena Sisters Trio. The Hub Trio. Photos courtesy Jared Hergenrader. After they hung up their skates, Len worked as a surveyor for U.S. Steel in Pittsburgh, Kenneth acted as the sales and catering manager at the Hacienda Inn in Fresno and Eddie sold ice cream before opening a drive-in restaurant in Fresno. Len passed away on February 8, 1981, Kenneth passed away on September 22, 1985 and Eddie passed away on June 22, 2010. 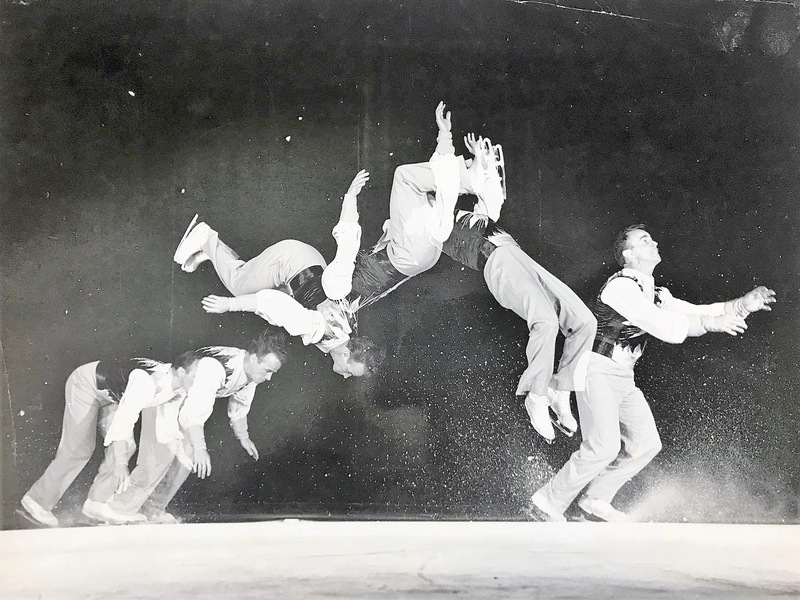 Though history may not have given them much credit, these back-flipping acrobats from New Hampshire were pioneers of one of figure skating's most popular tricks! Between the sinking of the Lusitania, the Spanish flu pandemic, the Eastland disaster in Chicago, the White Friday avalanches in Italy, the Halifax Explosion and the deaths of tens of millions in the Great War, the years 1914 through 1918 were some of the bleakest in the twentieth century. During an era when the first priorities of men and women around the world were service and survival, it would seem obvious that something as relatively insignificant as figure skating would take the back burner. The reality is that against all odds, skating not only survived the War... but in some parts of the world, it thrived. I would like to preface this project by clarifying that the research I'm presenting focuses solely on skating between July of 1914 and November 11, 1918, the date of the Armistice of Compiègne which ended fighting on land, sea and air at the end of the Great War. Excluded are details of the aftermath of the war and the subsequent revival of the Olympic Games in 1920 and European and World Figure Skating Championships in 1922. - Elaine Hooper, Matthias Hampe and Benjamin T. Wright - whose encyclopedic knowledges of British, German and American skating history never cease to amaze me. - Lesley Hall, Archivist of the Wellcome Library - for her insight into life on the home front in Great Britain during the War. - Mihály Orendi, Director General of the Hungarian Skating Federation - for his valuable insights into skating in Hungary during this period. Divided pond with behind Main Street in Tatamagouche, Nova Scotia with areas blocked off for hockey and figure skating, circa 1961. Photo courtesy Tatamagouche Heritage Centre. Do you know what's a good time? History. Do you know what's an even better time? Food. 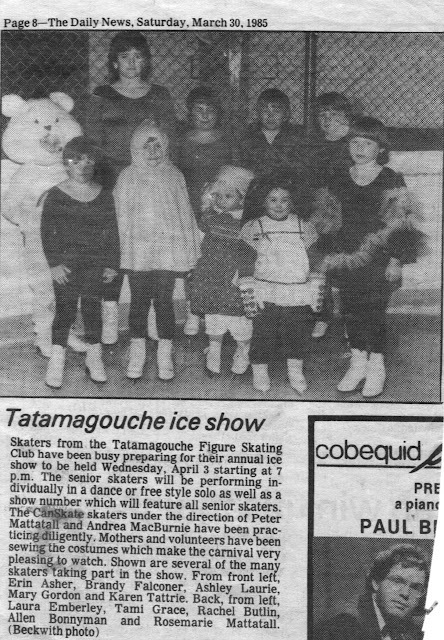 Today, we will blend the two with a brief look at the history of The Tatamagouche Figure Skating Club and a selection of delightfully eighties Nova Scotian recipes from the 1985 cookbook "Cherished Recipes Of The Tatamagouche Figure Skating Club". Back in 1971, plans were drawn up to build a multi-purpose arena in Tatamagouche, Nova Scotia. 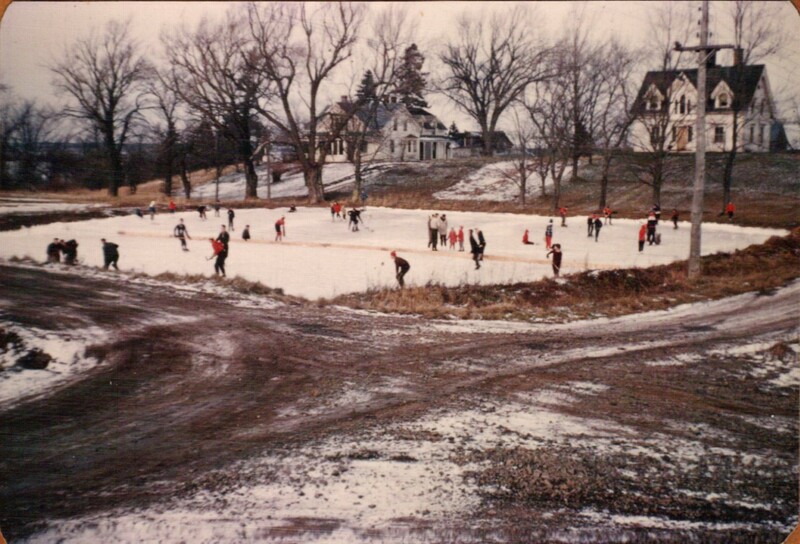 By 1973, the first phase of the project - a natural ice rink enclosed by a fence - was completed. In 1975, the North Shore Recreation Centre officially opened an indoor rink in a steel building with an artificial ice plant. That winter, Dr. Austin Creighton called a meeting of local citizens interested in developing a skating club and the Tatamagouche Figure Skating Club was born. At the club's first Annual General Meeting in April 1976, Mrs. Marjorie Hatherly reported that the club had been registered with the CFSA and had two hundred and fifty members. Skaters from Halifax came to Tatamagouche that year to reproduce their carnival and the following year, Susan Crowell arrived from Truro to provide the skaters with professional instruction. 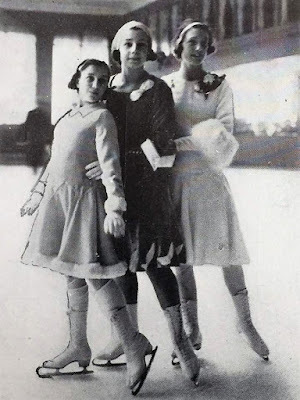 In the years that followed, Doris Byers organized a series of annual carnivals consisting primarily of local talent and classes were held for both beginner and intermediate skaters. By the late eighties and early nineties, many of the club's skaters joined the competitive skating arena... and in 2009 John Mattatall became the first skater from Tatamagouche to win a senior medal at the Canadian Championships. Now that you have had a quick primer on the club's early history, without further ado, a taste of Tatamagouche from the pages of a tried, tested and true skating club fundraising tradition... the cookbook! In a large skillet, barely cover haddock with water. Simmer gently till fish flakes with a fork, 12-15 minutes. Drain. Break fish into large chunks; set aside. Meanwhile, in a large saucepan, cook onion in 2 tbsp. butter or margarine till tender, but not brown. Blend in flour, salt and pepper. Add 1 c. of milk, all at once. Cook and stir till thickened and bubbly. Remove from heat. Add cheese, stir till melted. Use remaining 1/2 c. milk, add sour cream, cheese sauce, fish, peas and mushrooms. Turn into casserole dish. Melt remaining 2 tbsp. butter, toss with bread crumbs to combine. Bake, uncovered at 400 degrees for 15-20 minutes. Layer chicken and onions in Dutch oven. Mix together rest of ingredients and pour over chicken. Bake for 2 hours at 375 degrees (covered). Stir around a bit after an hour. If too much liquid, leave uncovered for the rest of baking time. Mix in the order ingredients are given. Drop on cookie sheet and bake at 350 degrees. Nuts and raisins may be added if desired. Combine first 8 ingredients. Form into small balls. Fry in oil until light brown. Combine pineapple juices, soya sauce, vinegar and brown sugar. Bring to boil, add 1/4 c. corn starch which has been blended with water. Cook and stir until thick and clear. Add meat balls, pineapple and green pepper. Heat about 3 minutes. The Peace Bridge Arena. Photo courtesy Fort Erie Public Library. Built in 1928 and owned by wealthy philanthropist and industrialist Frank Burkett Baird, the Peace Bridge Arena in Fort Erie, Ontario was really an answer to the members of the Buffalo Skating Club's prayers. 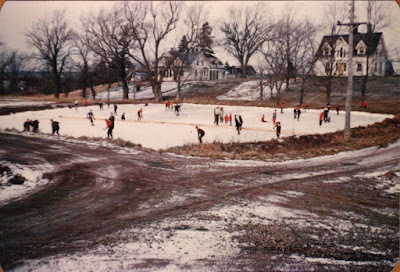 Prior to the rink's construction, members had practiced once a week (weather permitting) on natural ice at the Nichols School Indoor Skating Rink. On the artificial ice at the Peace Bridge Arena, figure skating flourished in the late twenties and early thirties. Ormonde B. Haycock, a former Canadian Champion, was hired as the new club professional and ice time expanded from one day a week to three days. The Weigel sisters - Mary, Estelle and Louise - each won U.S. novice or junior national titles in the early thirties and brought considerable attention to the club, which had been in existence since 1921. The 1935 Buffalo Skating Club carnival, held in conjunction with the Niagara Falls Skating Club at the Peace Bridge Arena was a complete sell-out and the social event of the winter season. The March 18, 1935 issue of "The Niagara Falls Gazette" boasted, "For several days before the affair was scheduled tickets couldn't be had for love, money or influence. Society for miles around, skating enthusiasts and hundreds who had never before enjoyed the colour, rhythm and skill of the great performance simply jammed the big arena." 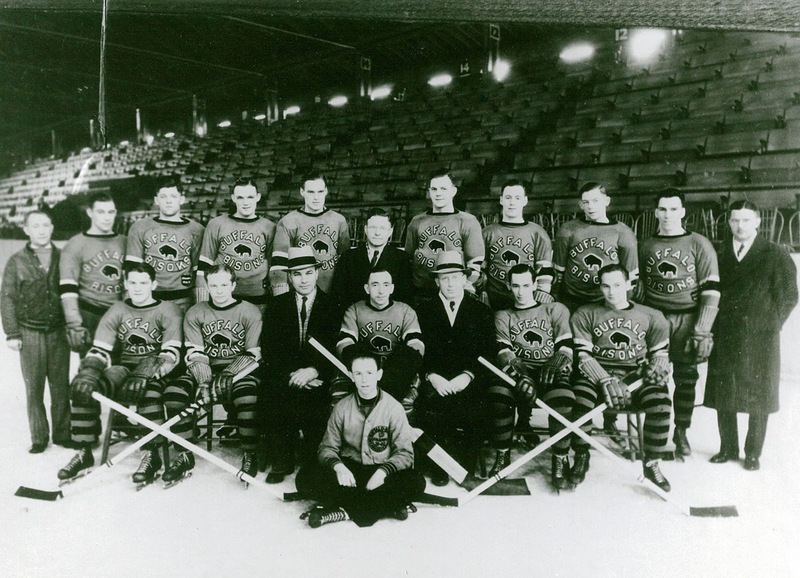 The Buffalo Bisons hockey team. Photo courtesy Fort Erie Public Library. Then, just as figure skating in Buffalo was at the height of its popularity, it all came crashing down... literally. With a huge roar, the roof of the Peace Bridge Arena collapsed at 9:30 AM on March 17, 1936. Under the weight of thirteen inches of heavy, wet snow during a freak St. Patrick's Day blizzard, huge steel girders came hurtling down seventy feet to the ice surface, side walls tumbled down and a part of the front of the rink was forced forward. No employees were in the arena at the time of the disaster, however members of the Buffalo Bisons, an International Hockey League team, were just arriving for their morning practice session. The March 18, 1936 issue of the "Syracuse Port Journal" reported, "One player, Jarvis, was dressed and ready to step on the rink when the roof buckled under a load of snow." Miraculously, many of the hockey players preparing for the practice hadn't arrived yet and those who had all escaped without serious injury. The incident harkened back to a similar incident twenty one years prior in Port Colborne, Ontario. A play-off hockey game that ran late was so packed that the rink didn't clear out completely until midnight. Only two hours later, the rink's roof collapsed under a heavy snowfall. The Peace Bridge Arena after collapsing in 1936. 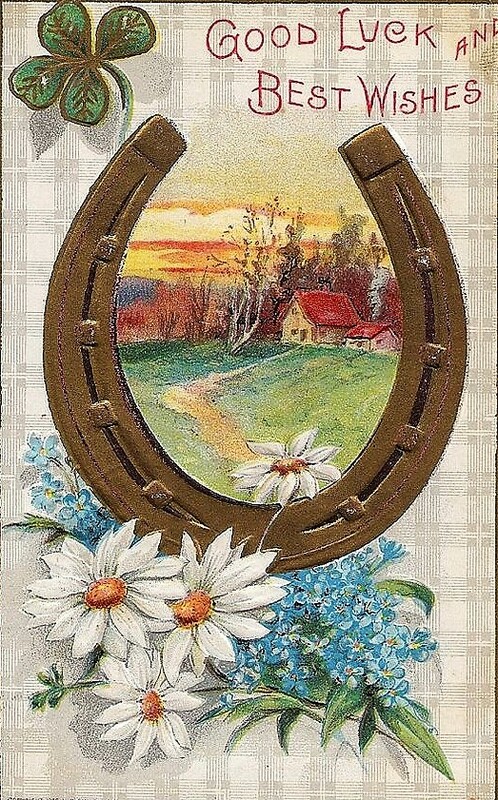 Photo courtesy Fort Erie Public Library. The afternoon of the disaster, members of the Buffalo Skating Club held a special meeting. For you see, the 1936 Buffalo Skating Club carnival had originally been slated to be held on March 21. 1936. 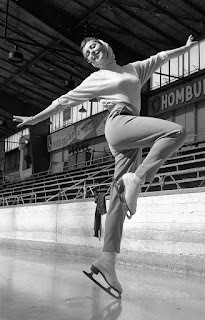 As it was an Olympic year and figure skating was at the height of its popularity with the Sonja Henie craze, ten thousand tickets had already been sold for the carnival and a who's who of North American skating had been invited to participate. Had the collapse happened only four days later during the carnival, thousands of people would certainly have perished. Among those who would have been in attendance were the show's director Gustave Lussi, Ormonde B. Haycock, the Weigel sisters, Audrey Peppe, Eleanor and Margaret Wilson of the Granite Club and the Toronto four... Mrs. Spencer Merry, Elizabeth Fisher, Hubert Sprott and Ralph McCreath. Despite having lost their rink - and nearly their lives - the members of the Buffalo Skating Club persevered. 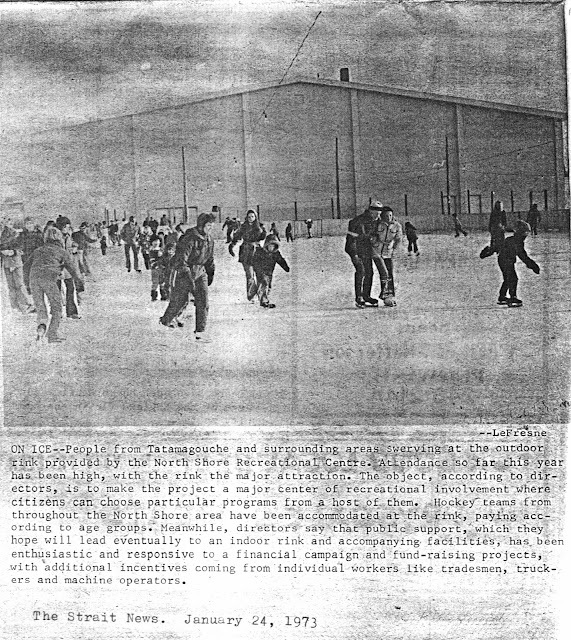 A history of the club penned in 1971 through material submitted by Mrs. Bryant Glenny, Mrs. Beryl Poutie Wilkinson, Mrs. Edward Weigel Atwill, Rita Lowery, John R. Smith and The Nichols School noted, "The Carnival was rescheduled for April 1 at the Niagara Falls, Ontario Arena. During the two week interim, rehearsals for the show were held at Mr. William W. Weigel's private skating rink at Pratt St., which was the first artificial rink built in Buffalo. Following the 1936 season the club suspended operations for a year and a half, though some members carried on their skating at the Weigel's private rink and at Niagara Falls. In the Fall of 1937, a group of club members coordinated with The Nichols School in equipping their rink with artificial ice making facilities. The compressors came from the old Broadway Auditorium and are still being used to make ice at the Dann Memorial Rink, in addition to an artificial compressor needed for a much larger ice surface." 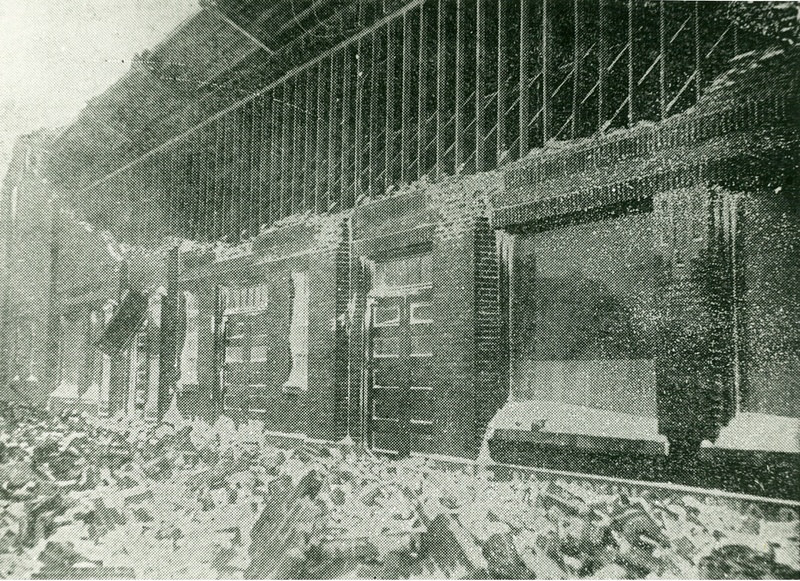 Although the perseverance and 'the show must go on' attitude of the Buffalo Skating Club's members was incredibly admirable, the Peace Bridge Arena collapse could have certainly been one of the biggest tragedies in figure skating history. It's certainly a reminder that when it comes to skating... timing is everything. Skate Guard is a blog dedicated to preserving the rich, colourful and fascinating history of figure skating and archives hundreds of compelling features and interviews in a searchable format for readers worldwide. Though there never has been nor will there be a charge for access to these resources, you taking the time to 'like' on the blog's Facebook page at http://www.facebook.com/SkateGuard would be so very much appreciated. Already 'liking'? Consider sharing this feature for others via social media. It would make all the difference in the blog reaching a wider audience. Have a question or comment regarding anything you have read here or have a suggestion for a topic related to figure skating history you would like to see covered? I'd love to hear from you! Learn the many ways you can reach out at http://skateguard1.blogspot.ca/p/contact.html7. Born September 9, 1856 in New York City, George Dawson Phillips was the son of James and Mary (Seguine) Phillips. He practically grew up on the ice and on December 1867 at the age of eleven won his first skating title - a one mile speed skating race - on 46th and 5th Avenue, the future site of the grand Windsor Hotel which burned to the ground in a devastating fire on St. Patrick's Day, 1899. Like that fire, George raced through his early skating career, dominating American speed skating competitions for twenty years from 1867 to 1887. He competed against Norway's Axel Paulsen, won the Championships Of America in the two hundred and twenty yard, five, ten and twenty five mile distances and set records which remained unbeaten until the late nineteenth century. In his book "How To Become A Skater", writer Frederick Toombs recalled, "During 1883 and '84 G. Phillips created a furor by sprinting one hundred yards in '10 3-58, 220 yards in 22 3-58, and a quarter mile in 44 1-5s, from a running start and without wind." At only five foot five and between one hundred and twenty and one hundred and thirty five pounds, George earned himself the nickname 'The Spider'. In 1886, near the end of his speed skating career, George reinvented himself as a figure skater. Acclaimed for his cross-cut vines, he finished third at the Championships Of Canada in February 1890 behind Louis Rubenstein then tied with him at the 1891 Championships Of America. In 1892, he claimed the American title with a fifty one point lead over his closest rival. "Harper's Weekly" noted that he gave a "very clever exhibition" at the event but that without Rubenstein in attendance the event "was something of a disappointment". He returned to win the Championships Of America in Hoboken in 1895 and at the St. Nicholas Rink in New York City in 1897. However, his third win was shrouded by controversy. On January 27, 1897, The New York Tribune reported, "It was learned last night that one of the contestants will challenge Phillips. This man maintains that Phillips managed the Ice Skating Palace last winter, and therefore is a professional. Phillips asserts that his only relation to the Palace was as a broker in getting a loan for it. The protestant, however, will tonight exhibit two receipts, which purport to have been given by Phillips for salary paid him as a manager." A businessman by trade, George was also an accomplished oarsman with the Hudson Boat Club and long time member of the New York Athletic Club. An 'old time fancy skater' through and through, he prided himself on precision and strong technique and looked down upon the trend for 'showiness' amongst skaters around the turn of the century. In "Harper's Weekly", he wrote, "There is no recognized sport in which in the fine points are so little understood by the general public as in figure skating. This is proven by the applause which frequently follows the exhibitions of showy skaters as compared to finished and methodical competitors. In many of our amateur championship competitions this has been the case, and reporters of our daily papers have been the worst offenders, often putting their ideas in print when they have been in direct opposition to the judges' decisions." 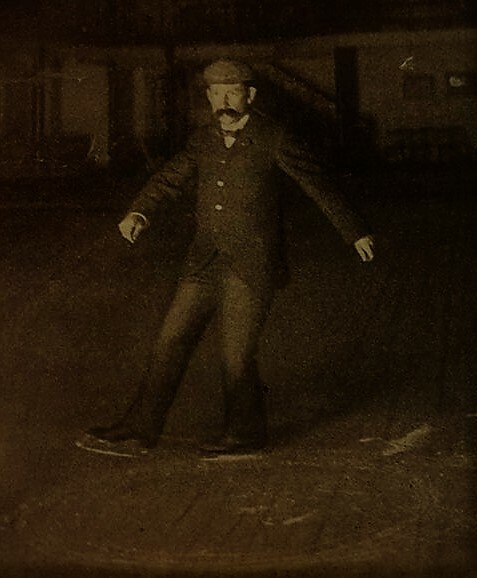 Further evidence that George resisted the trend for 'showy' skating presented itself in the January 30, 1901 issue of "The New York Daily Tribune". They reported, "Something new appeared at the local rinks last night, and while the performance was going on George D. Phillips, the old-time figure skating champion, and Dr. A. G. Keane, the present champion, fairly held their sides. Everybody else who saw the contortions of the skater were convulsed. Somebody said. 'Ragtime stunts on ice.' and the onlookers accepted the expression as the proper thing under the circumstances. At the end of the hockey game at the St. Nicholas Rink there was the usual scramble by the men. women, boys and girls to get upon the ice and enjoy skating themselves. Then an innovation appeared in the form of a youth of probably seventeen years. He wore skates of the old fashioned Dutch rocker sort, with short iron plates and with regular sleigh runner twists In front. Possibly the skates had something to do with the gyrations, and then again it may have been a nervous twitch of the muscles, combined with an erratic temperament. Whatever it was. the performance was one of the most remarkable ever seen on the ice. Cross-cuts were made backward and grapevines sideways. A spread eagle would suddenly turn into pirouettes, and hoops and ringlets were made as they were never made before in the memory of the oldest fancy skater. The young fellow did not mind the attention he created, but continued to cut those queer capers on the ice until it was time to close the rink. Several of the experts who tried to imitate him nearly broke their necks." By the late nineteenth century, George finally retired from competitive skating. After the death of his first wife Charlotte Berry Corbett, he married Kentucky born Julia Biddle Coakley on April 29, 1905 and got in the ice manufacturing business. Julia got in the business of inventing space saving furniture. George also became involved with the International Skating Union of America, helping develop a committee for the Eastern Skating Union. In November 1928 at the age of seventy two, George was honoured for his skating achievements by the Amateur Athletic Union at a gala banquet in New York City. He passed away on May 7, 1933 in Manhattan, New York at the age of seventy six. During his heyday "The Weekly Transcript" claimed, "In athletic circles, particularly skating, George D. Phillips is, without a doubt, one of the best known men in America." On January 5, 1959, George's wife Julia passed away the age of eighty eight. 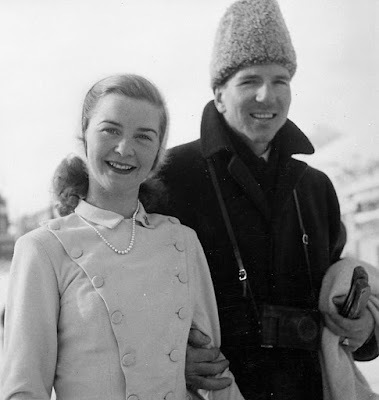 In her will, she left a bequest of ten thousand dollars to one Norman Thomas with a special provision: that the money be used "to promote peace and love among the people of the world and destroy hatred." A beautiful end to a fascinating story if there ever was one. A black cat crossing your path, spilling salt, walking under a ladder, opening an umbrella indoors and breaking a mirror are are all sure signs of bad luck to the superstitious among us. Those in search of good luck rarely walk down the aisle without something old, new, borrowed and blue. They have lucky rabbit's foots, horseshoes and pennies, break bottles over the bows of new ships as they are launched and cut the hair from a dog that bit them. 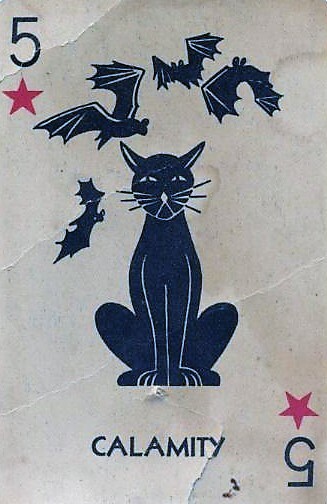 Not all superstitions are as 'simple' as the signs of good and bad luck. There are those who make the trek to Ireland to kiss the Blarney Stone, in hopes of earning the gift of eloquence. There are shopkeepers that refuse to sweep the sidewalk in front of their stores before the end of the day, lest they sweep away the day's trade. Centuries ago in Ireland, many believed that if you didn't make the sign of the cross and close your baby's mouth before they yawned, the Devil could rush into their body. According to old English lore, stirring your tea 'widdershins' (from right to left) foretold a fight, and if two women drank tea from the same pot, one of them would become pregnant. Many actors refuse to use real flowers on stage or peek through the curtain at an audience before a play. They say "break a leg!" instead of good luck and never mention the exact number of lines they have, for fear they'll forget some. They never refer to the play "Macbeth" by its name, opting to call it "The Scottish Play" instead... for fear of death. Though actors have historically earned a reputation for being some of the most superstitious folks out there, they really have nothing on figure skaters! Long before figure skating competitions were 'a thing', residents of Utah always placed their skates on top of something solid after carving out fancy figures on a pond. They feared that if their skates were hung from a hook, they would fall through the ice and drown the next time they skated. Not long after skaters began competing, the superstitions really began. Tropes like "a poor practice means a good competition to come" and "it's bad luck to draw first in the starting order" have been around since the days of Ulrich Salchow and Gillis Grafström. Three time Olympic Gold Medallist Sonja Henie once claimed a paper cutter, with a blade as sharp as her skates - brought her the good luck to win her first World title in Oslo, Norway in 1928. During her competitive career, the media went bananas with stories about how - although she brought many pairs with her - she just had to wear her 'lucky skates'. In reality, they were simply the pair she was using at the time. In her autobiography "Wings On My Feet", she lamented, "Much more was said about the fact that father took special care of them for me than was mentioned about my technique or skating background." Later, during her professional career, she refused to wear new laces in her skates when she started working on a new film. She once quipped, "Superstitions give your courage such a nice fake boost." 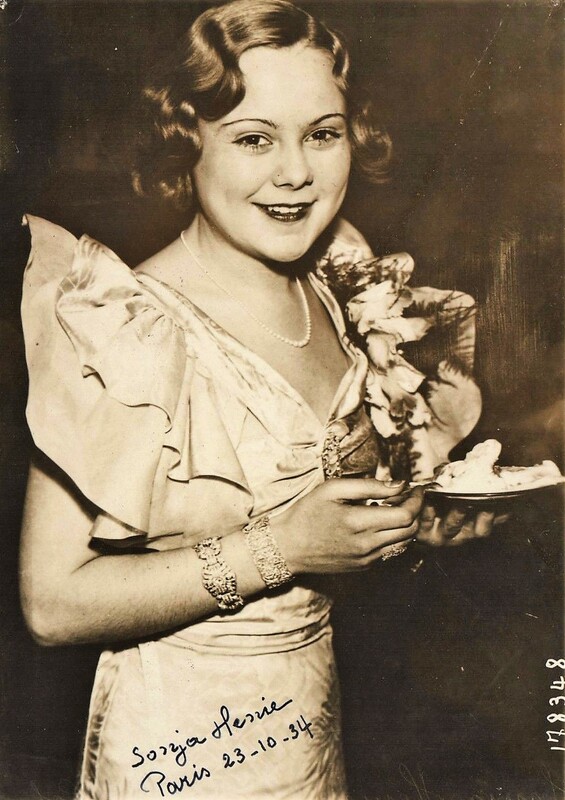 One of Sonja Henie's rivals, Cecilia Colledge, wanted to wear a green satin dress for her free skating performance at the 1936 Winter Olympics in Garmisch-Partenkirchen. Though she always felt she skated best in the green dress, her mother insisted she wear silver. Not even her 'lucky zoo' of stuff animals saved her from finishing the event in second place. One of Cecilia's successors, Daphne Walker, started wearing a green elephant talisman at the age of eight for good luck and collected over three hundred elephant ornaments. Like Cecilia, she often wore green dresses in competition, flying in the face of the superstition that green was an unlucky colour. Jack Dunn and Sonja Henie. Photo courtesy Minneapolis Historical Society. Interestingly, two of Great Britain's top men's skaters during the thirties tragically passed away in their twenties... their deaths both linked to 'cursed' objects. Freddie Tomlins was killed over the English Channel while serving with the Royal Air Force in 1943. In 1937, he had been presented with an eighteen carat gold watch by Adolf Hitler. It was inscribed with the words, "To our dear Freddie Tomlins in remembrance of his skating in the Berliner Sports Palast, March 29 to April 4, 1937". Jackie Dunn, a 1936 Olympian who had gone to America in hopes of finding success on the silver screen, contracted tularemia, a rare disease spread by rabbits, and passed away after wearing a supposedly cursed ring once owned by Rudolph Valentino. He had been set to play Valentino in a film. The professional skating boom during World War II wasn't without its superstitious skaters. 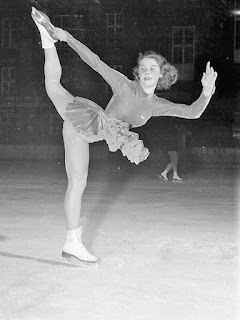 Canadian Champion Norah McCarthy, who toured with the Ice Follies, wouldn't take the ice unless she was wearing her lucky yellow anklets. Backstage at the Center Theatre, coffee was nowhere to be found. Freddie Trenkler, one of the ice clowns who starred in the show, recalled drinking coffee the first time he took a nasty spill and insisted that only tea was drank by the cast. 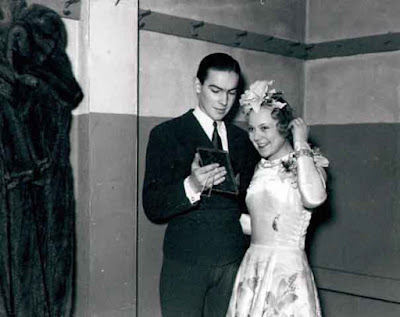 Joan Hyldoft, who skated with Freddie at the Center Theatre, had a bad habit of whistling in the dressing room. Her Irish dresser, Kitty, would send her outside and make her say two curse words before she would let her back in... to drive away the bad luck. In 1946, Patricia Molony, the first Australian woman to compete at the World Championships, wouldn't take the ice unless she was wearing a bracelet of Australian charms and a New Zealand tiki. 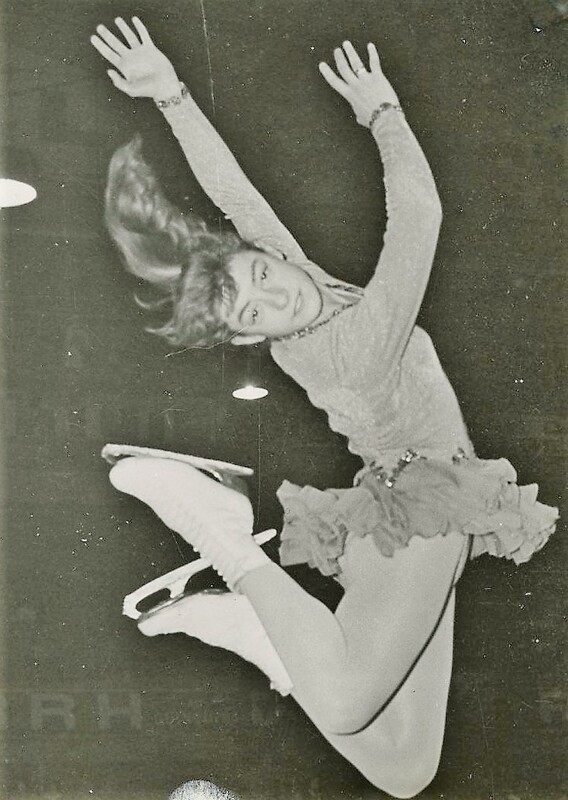 She always wore the same red socks (inside out) in her boots and - like Cecilia Colledge and Daphne Walker nearly a decade prior - considered green her lucky colour, wearing it for both figures and free skating when she competed. Some believed that Barbara Ann Scott's appearance on the cover of "Time" magazine on February 2, 1948 would 'jinx' the young skater's chances at the Winter Olympics in St. Moritz, but the Canadian darling proved them wrong when she won Canada's first Olympic gold medal in figure skating. 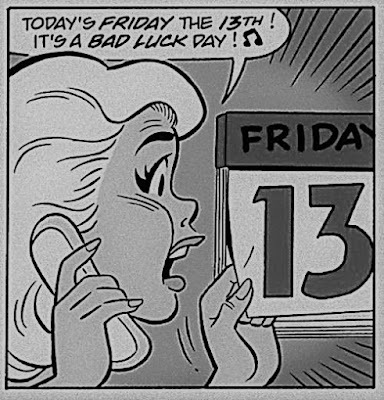 Barbara Ann was one of the most superstitious skaters in history. She thought it was bad luck to whistle in the dressing room and to place skates anywhere but on the floor when they were not in use. She had a lucky stuffed koala bear named Junior and some ivory elephant figurines she took everywhere with her. Her mother also bought her a good luck gnome in Stockholm, which she described as a "little carved wooden man, the ugliest little man I've ever seen, with a great long nose and a funny little hat on." She too considered green her lucky colour. In her book "Skate With Me", she recalled, "I have, I think some reason for being superstitious about the number five, because several times when I was growing up I came in fifth in a competition the first year I entered and then, the next time the competition was held, went back and came in first. And I like to draw the number thirteen, because I think that is lucky for me. My armband at the Olympic Games was Number 13 and I skated on Friday the 13th in the World Championships in '48." 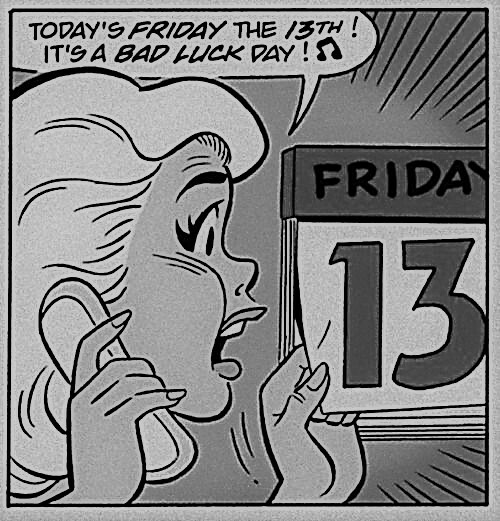 Barbara Wagner was superstitious about the number thirteen. An article that appeared in "Imperial Oil" magazine in October 1957 noted, "When she started school, she came home with a 13 for her mother to sew inside her coat and she graduated from St. Clement's girls' school last June 13. In most competitions she manages to find a 13 either on a hotel room or a street number. Always on the watch for her lucky number, Barbara was happy when she found out she had been assigned no. 58 in the World Championships in Colorado Springs. 'After all,' she points out, 'eight and five make 13, don't they?'" Maribel Vinson Owen's daughter 'Little Maribel' won the U.S. pairs title in 1961 with Dudley Richards and perished in the Sabena Crash shortly thereafter. She carried a silver four leaf clover with her wherever she went. 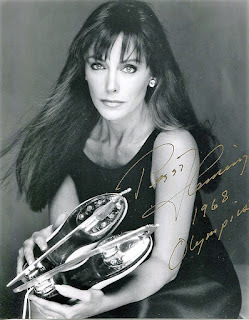 Olympic Gold Medallists Peggy Fleming and Dorothy Hamill had more than the same coach in common. They both tied their left skate first. One of Dorothy's competition rituals involved setting up a collection of stuffed animals on the boards when she competed in school figures - a koala, a troll and a monkey. After the figures at 1976 World Championships, her good luck charms disappeared. She took it as a sign her childhood was over. 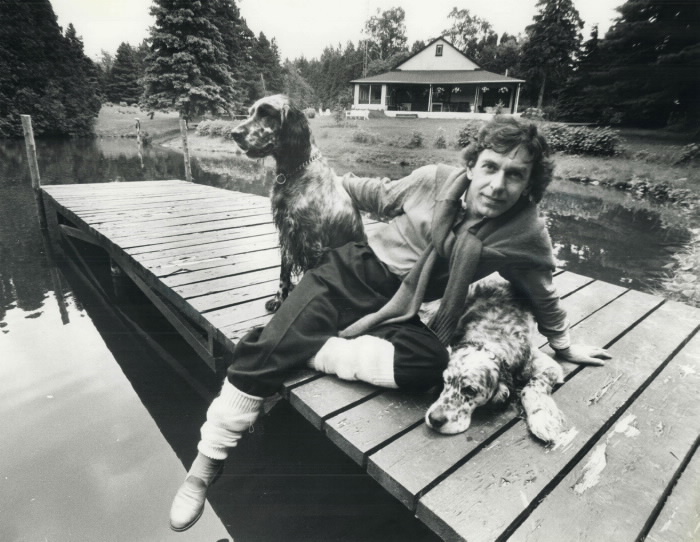 Toller Cranston. Photo courtesy Toronto Public Library. During his competitive career, Toller Cranston was obsessed with numbers, believing for instance that if the went through a ticket wicket at an airport numbered five, he'd end up fifth at his next competition. In his book "When Hell Freezes Over", he recalled, "Throughout my skating life, I was haunted by the frightening sense that everything I did - how I got on the ice, my numerical starting position, the colour of my costume, the way I laced my skates - was fraught with earth-shattering importance. If I made the wrong choice, everything would blow up in my face. I was tap dancing on a volcano. One wrong tap might activate the lava flow." In 1986, he changed hotel rooms in Paris because the first room number "didn't add up to the right number." He also had a lucky costume he used for ten years and once quipped, "In a pinch, I will always go to that costume. I swear it jumps by itself and never falls down." Robin Cousins had a four leaf cover sellotaped to his skate bag, given to him by a fan at the 1976 Winter Olympics in Innsbruck. John Curry and Dorothy Hamill were also both given one at the same time. Tai Babilonia has long worn a lucky crescent moon pendant given to her by Stevie Nicks. She received it in the mail a month before the 1980 Winter Olympics in Lake Placid, and wore it every day leading up to the pairs competition. Concerned it may become unfastened during her performance with Randy Gardner, coach John Nicks asked her to take it off. That same day, bad luck befell the pair and they were forced to withdraw due to Randy's groin injury. For years, Jayne Torvill always wore the same pair of socks in every major competition. After they became so disintegrated she couldn't wear them anymore, she continued to carry them around with her. Christopher Dean had a pair of lucky pants... and a thing about skate guards. He always placed he and Jayne's guards parallel on the boards and would keep watch to make sure no one disturbed them. Katarina Witt needed Jutta Müller to pat her on the back of the hand before she skated. She also had three stuffed animals given to her by friends that she carried in her skate bag for good luck. One was an angel. In her book "Only With Passion", she explained, "The angel always had to lose both of its wings every season. One of the wings had to come off at the European Championships, and the other wing had to come off at Worlds. Believe me, in an Olympic year we had a dilemma: three competitions and only two years. Then every year I sent the angel to be repaired so the wings could be ready to fall off the next year. It was tricky, because my therapist wasn't allowed to pull the wings off. They had to fall off by themselves, with a little encouragement. She had to be rough on the angel, to loosen the wings, but not too rough." Liz Manley always had a superstition about cleaning and organizing before any competition. Even at the 1988 Winter Olympics in Calgary, when she was sick as a dog, she did all of her laundry and tidied her room as if she'd never been there before going out to perform the free skate of her life. Brian Boitano would carry a bent nail from the stage at the San Francisco in her skate bag for good luck. Brian Orser wouldn't allow family members attending his competitions to sit together. He would always put his left skate on first and had to have a walk before he competed. He kept a certain stuffed animal in his skate bag for ten years, given to him by a skater who he helped pass a dance test. He also believed it was a good omen if a friend from Orillia showed up at the last minute and let him know he was in town. Kurt Browning carrying the Canadian flag. Photo courtesy Library And Archives Canada. There was a superstition in the nineties that Canadian athletes who served as flag bearers at the Olympic Games were jinxing themselves in their quest for medals. In 1992, decathlete Michael Smith was forced to withdraw from the Summer Olympics in Barcelona due to injury, and Kurt Browning - who was flag bearer at the 1994 Winter Olympics in Lillehammer - finished off the podium. At the 1996 Summer Olympics in Atlanta, Charmaine Crooks placed a disappointing eighteenth in the 800 meters. Ironically, Kurt was actually the only Canadian figure skater in history who served as flag bearer at the Olympics and didn't win a medal. The honour proved to be a good luck charm for Tessa Virtue and Scott Moir, Brian Orser, Karen Magnussen, Bob Paul and Norris Bowden. Kurt Browning's good luck charm was a pair of skate guard covers. 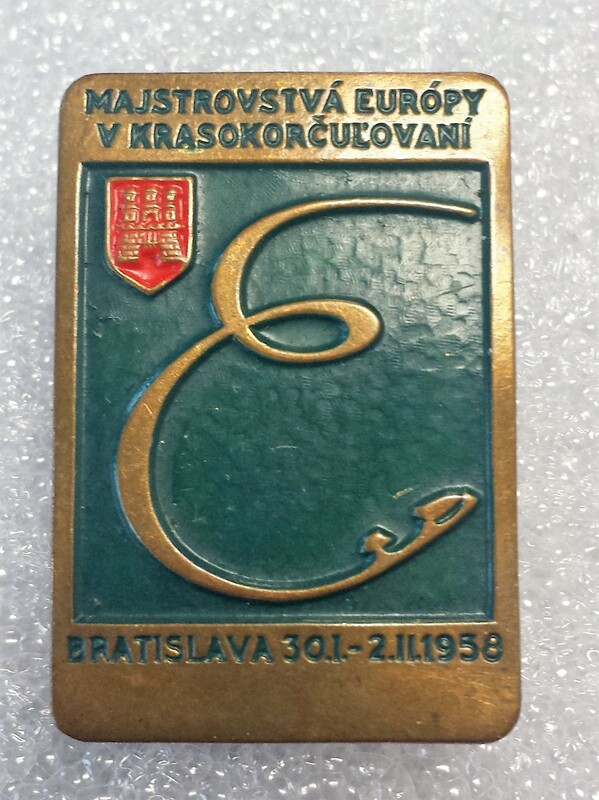 Elvis Stojko's was a necklace given to him by his mother, with a charm added by his aunt and uncle. On one side of the charm was the Olympic logo, on the other it read "Elvis, you're number one!" Fellow nineties stars Michelle Kwan and Jennifer Robinson also had lucky necklaces. Jennifer's had a photo of her future husband inside, and Michelle's was a dragon necklace with special family significance. Tara Lipinski always would step on ice with right foot first; Oksana Baiul her left. Both skaters won gold medals in the nineties in their first trips to the Winter Olympics. Oksana claimed her lucky number was three, and that was the number she drew in her group's starting order in the women's free skate at the 1994 Winter Olympics. Since 2000, skaters haven't let up a bit in their superstitions. Evgeni Plushenko never shaved on the days he competed. Irina Lobacheva had a doll she'd put on the boards while competing. Joannie Rochette's mother would always put a prayer necklace in her skate bag. Jamie Salé put her left skate on first and would take off her lucky necklace, touch it and say a little prayer before she competed. Sasha Cohen had to be first on the ice for every warm-up. Marina Anissina wouldn't take the ice without a cross made my partner Gwendal Peizerat's grandmother around her neck. Yuna Kim always wore a rosary ring. She forgot to bring it to the 2010 World Championships, and went out and bought one just for the competition. Scott Moir often wore new socks for every event and Tessa Virtue would always sit her water bottle on the same place on the boards. Barbara Fusar-Poli always put her blades in the same position in the dressing room to dry. In a March 23, 2001 article in "The Province", Maurizio Margaglio was vague about his superstitions, only revealing he always tied his skates the same way before every performance. He joked, "We have [superstitions], of course - every skater has... I think it's psychological, and in Italy, we have a little bit of superstitions. But I'm not taking red peppers in my pocket or anything like that." Skaters competing today aren't any less superstitious. Nathan and Karen Chen are both members of the 'left skate first' club, Kaetlyn Osmond has to have a glass of orange juice before she takes the ice and Yuzuru Hanyu's famous lucky Pooh Bear almost pales in comparison to his elaborate pre-competition rituals. Whether an attempt to ward off bad luck or bring good luck from the Skate Gods, the rituals of skaters serve as reminders that no matter how hard you train, the ice is slippery... and a little bit of superstition isn't always a bad thing. 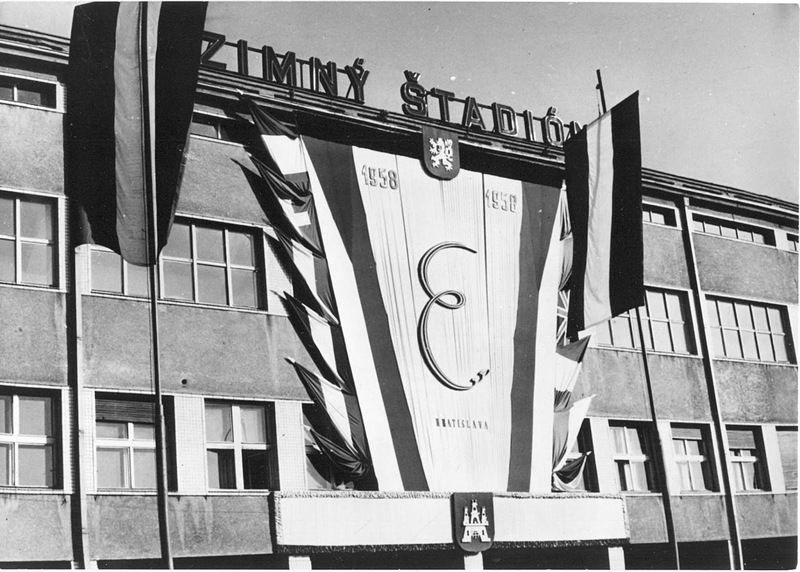 From January 30 to February 2, 1958, Zimný štadión in Bratislava played host to the first post-World War II European Figure Skating Championships to be held entirely on indoor ice. A whopping seventy entries from eleven countries participated. 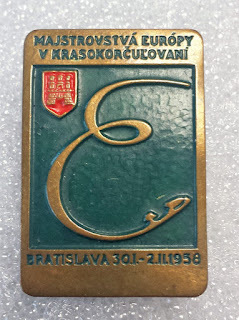 The event, organized by the Czech State Committee For Physical Training And Sport, marked the first time the Europeans were held in Czechoslovakia since 1948, ten years prior. 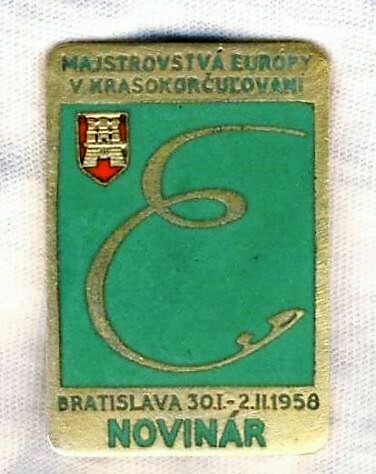 Vladislav Cáp, a Czechoslovakian engineer who competed at the 1948 European Championships, designed the event's emblem - the letter 'E' with a skate blade. Alain Giletti, Karol Divín and Alain Calmat in Bratislava. Photo courtesy Archív TASR. Considering the anti-German sentiment and post-War expulsions of Germans in Czechoslovakia following World War II, the West German contingent of skaters was treated exceptionally well. Heinz Magerlein recalled, "The reception [in Bratislava] was very touching when, after a long journey, the German team got out of the passenger train shortly before midnight and delegations from sports clubs and companies had arrived. Poems and welcome speeches were recited in hard German, and from the Gesidern the joy shone, that we had come. In the shop windows of the prisoners we saw everywhere indications of the ice sports event, sculptures made of dough, fabric decorations, etc. However, the very spacious sports hall had a drawback: from an open piece of the roof soot fell on the ice and had left a fine layer that looked like emery and damaged the expensive ice skates badly." Let's take a look back at how things played out on the ice in Bratislava! Nineteen men from ten countries competed in the men's event. Karol Divín defeated Alain Giletti in a four-three split of the judging panel in the school figures. British Champion Michael Robert Booker placed a strong third. fittingly managed to do it in his home country... defeating the defending champion in the process. Norbert Felsinger of Austria placed fifth and a trio of West Germans finished sixth through eighth. 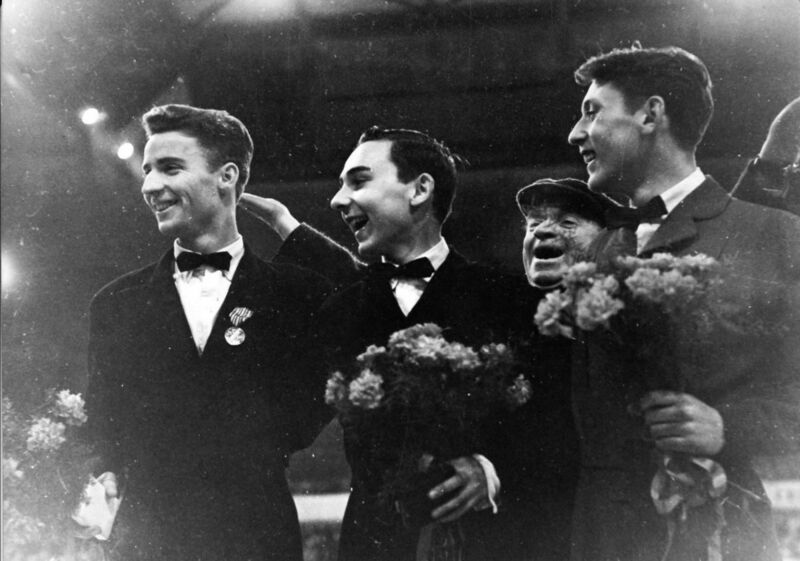 Tilo Gutzeit, the top skater of the bunch, received second place ordinals in the free skate from the Czechoslovakian and Soviet judges. Manfred Schnelldorfer, who placed seventh, suffered a wardrobe malfunction. Heinz Magerlein recalled, "In the freestyle, Manfred picked again, as so often, the starting number one. I had fastened Manfred's silver-shimmering tie with a small safety pin on the high waistband of the coat trousers. His spinning spurred the spectators on to hurricane applause. The tie had come loose from the attachment and struck him in front of his eyes, his nose, his mouth... In between it wrapped itself once or twice and around his neck and it did not wiggle. What was worse: looking for me or skating for Manfred? He did not fall, but he fought a desperate fight with the tie, which shook his sight and direction. One could see that he was close to bursting.... I blamed myself and decided to check everything out ten times since and have kept that tie to this day." Hanna Walter and Ingrid Wendl. Photos courtesy Bildarchiv Austria. Defending champion Hanna Eigel had turned professional, leaving the European women's title up for grabs. Eight judges had her compatriot Ingrid Wendl first in figures, while the Italian judge tied her with Hanna Walter, who finished second. Joan Haanappel was a unanimous third. France's Dany Rigoulot earned ordinals ranging from fourth to seventeenth in figures... highlighting the nightmarish judging that was to come in the free skate. Left: Dany Rigoulot. Right: Joan Haanappel. Photo courtesy Dutch National Archives. Ingrid Wendl decisively won the free skate with seven first place ordinals but that was about the only thing the judging panel could seem to agree on. 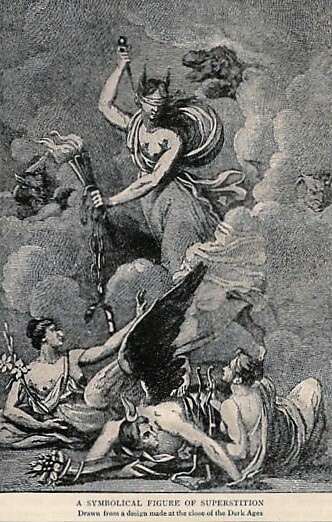 Six judges had Hanna Walter in the top three; the Swiss judge had her eleventh. Jidrinka Kramperova had ordinals ranging from second to fifteenth. Five judges had Karin Frohner in the top three; the Czechoslovakian judge had her eleventh. The West German judge had Regine Heitzer in a tie for first, while the Polish judge had her a tie for eighth. Strangely enough, when the overall marks were tallied all but one judge had Wendl first, all but one judge had Walter second and every judge had Haanappel third. Yet Jana Docekalova of Czechoslovakia, who earned two first place ordinals in the free skate, finished eleventh overall. More than fifteen thousand spectators showed up for the pairs event... and the bizarre judging continued! Though Věra Suchánková and Zdeněk Doležal defended their title unanimously, no less than eight teams received top three ordinals. Nina and Stanislav Zhuk, Joyce Coates and Anthony Holles and Marianna and László Nagy, who placed second through fourth, were three of those teams. The Zhuk's and Coates and Holles' medal wins were both considered surprises as they had only finished fifth and sixth the year prior at Europeans. Another team earning a top three ordinal was Marika Kilius and Hans-Jürgen Bäumler, who one judge tied for second and another placed thirteenth. Heinz Magerlein recalled, "They had left the hotel in good time with car, but a railway barrier had considerably delayed the journey. Since they had pulled start number 1 - which also had their share in fifth place! - of course, they were resented in the rink, which was filled to capacity... Lacking concentration and still under the impact of the annoying [delay] they milled about the ice, and their performance fell short of their potential." 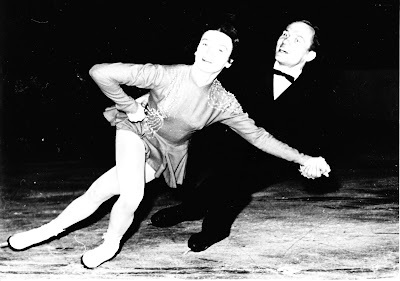 Ludmila Belousova and Oleg Protopopov, who received no first place ordinals, were tenth with scores ranging from fourth to thirteenth. It was the young Soviet couple's first appearance at the European Championships. Perhaps most dramatic were the scores of the Austrian team who finished eleventh. The British judge had them second, while the Polish judge had them fifteenth and dead last. One has to doubt whether any of the ice dancers complained when only five judges sat rink side to judge them instead of nine. In contrast to the women's and pairs events, the judging in dance was somewhat less controversial... at least near the top. To no one's surprise, defending champions June Markham of Durham and Courtney Jones of Bournemouth were the unanimous winners of both the compulsories and free dance. In his book "This Skating Age" Howard Bass recalled, "The cost of travel and accommodation for two people from London to [Bratislava and Paris - the site of the 1958 World Championships] can be reckoned at well over one hundred pounds. The sum actually allowed them by the N.S.A. was twenty pounds each. So patriotic Britons must thank the fact that Courtney and June happened to be able to raise sufficient money themselves to pay for the privilege of winning these titles for their country! As their compatriot, I feel like hiding my head in national shame. How humbling, how utterly humiliating!" teams who placed fifth through seventh each received ordinals ranging from fifth through tenth. European Championships. They placed dead last.